A serial killer who murdered four people was found in a pool of blood at Broadmoor Hospital after being moved to a lower risk ward, an inquest heard. 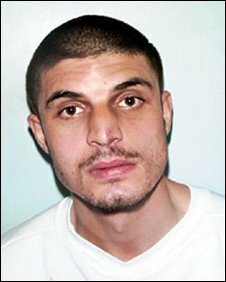 Daniel Gonzalez, 27, of Woking, Surrey, was given two life sentences for the murders in 2004. Nurses found him in his room at the Berkshire hospital on 9 August 2007, an inquest in Windsor was told. He had a deep cut in his arm and a makeshift blade was found near his body. Doctors could not revive him. Psychiatrist Tim McInerny told the inquest at the Guildhall the crimes and the sentence he received for them, caused Gonzalez, a paranoid schizophrenic, great anxiety. Gonzalez's trial heard that he had wondered what it would be like to be Freddy Krueger, from the Nightmare on Elm Street horror films, for a day. He went on a three-day rampage in September 2004 and randomly killed two men and two women and attacked two others. Tim McInerny said: "The accounts given by consultants say that Danny was one of the most disturbed and sick young men that had been treated at Broadmoor Hospital for years." The inquest jury heard that Gonzalez, who had a history of self-harm, was treated in the hospital's high dependency unit for two years. He was moved to a series of lower risk wards when improvements were seen in his condition. Gonzalez was transferred to a young people's unit called the Windsor Ward in July 2007, 17 days before his death, where he was observed every 30 minutes. Dr McInerny said he appeared happy and seemed to have settled. On the morning of 9 August nurses became concerned that he had not collected his medication. When they went into his room at about 0820 BST they found his walls and bed covered with blood. It is thought he had been dead for about 30 minutes. Roger Coles, who had been a nurse at the Berkshire hospital for 33 years, was so shocked by the scene that he has not worked there since. Nurse Natsai Gwazemba said she had observed Gonzalez through a window next to his door just before 0800 BST but did not look at him for long as he was half-naked. Staff said they believed Gonzalez had stopped self-harming and were shocked by his death. Gonzalez was diagnosed as suffering from schizophrenia in 1998. In March 2009 an independent inquiry into his health care found that he was "not treated successfully" but there was nothing to suggest his potential for violence was overlooked.